This is my friend Dahlia and her adorable baby girl, Shalom. She's 6 months old now and already crawling! Unfortunately I didn't get any pictures of her awake... which she actually was quite a bit of the time! 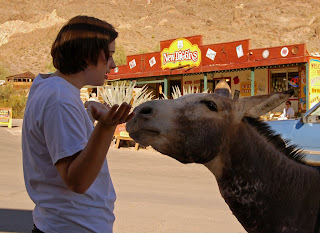 So on the day before I left Dahlia took us all out to Oatman. It's this little dinky tourist town out in the mountains... located on Route 66. 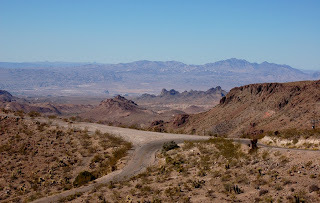 I never quite knew what Route 66 was... until we drove through the mountains on this really windy narrower than a two lane road with about 16 inch high "guard rails" which were really old rock walls that had cement poured over them. Just a little freaky! This is a picture from the top of the pass. If you click on it you can see the shape of the road. From this point you are also supposed to be able to see into California and Nevada. 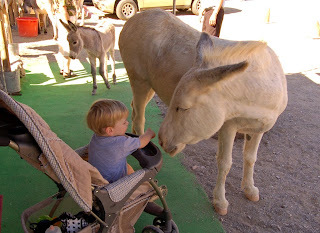 Oatman is only "famous" because there is a herd of "wild" burros that live there. 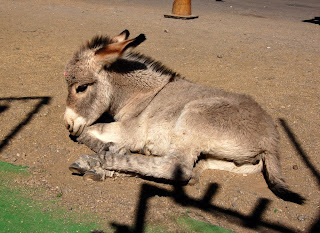 These are descendants of the donkeys the miners used in these hills. When they left, they left their animals behind and the town has taken care of them and become famous for it. They're definitely not wild anymore though! The baby has a sticker on it's head that says don't feed me! 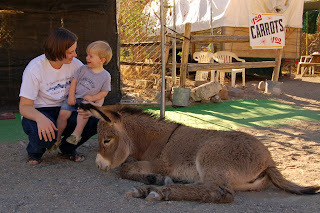 You can bring (or buy) carrots to feed the burros, but the babies will die if they eat anything other than their mama's milk. 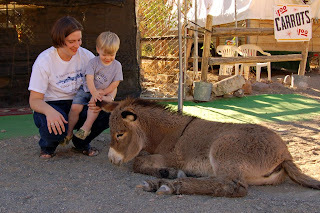 The shop keepers are pretty vigilant about this since they're the ones who pay the vet bills (and of course the burros are their livelihood). It's just a little tiny brown dusty town. It took us all of an hour to walk up one side and back down the other - including stopping in every single shop. 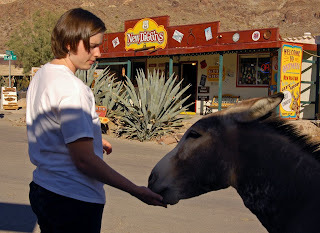 Poor Taval was totally freaked out by the burros. And it was even worse when a couple of them got into a little "fight" braying really loudly and hop kicking at each other. It would have been funny if we didn't have so many little kids around with us. This one was especially persistent so I was trying to draw it away from the kids. Of course it didn't understand when I didn't have any more carrots and got right up in my space! 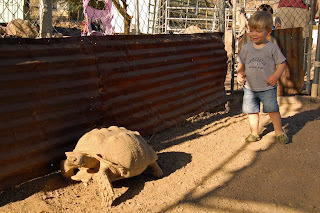 Then Dahlia took us around back one of the shops... where a lady raises desert tortoises! You can see how big they are and I was actually surprised at how fast they move. At one point I thought they had all gone in their "house" except the one I was trying to take pictures of. So I squatted down and almost sat on one that had come up behind me! I don't think I would have liked it's response if I had! This one thought Cory was interesting, but he wasn't so sure. 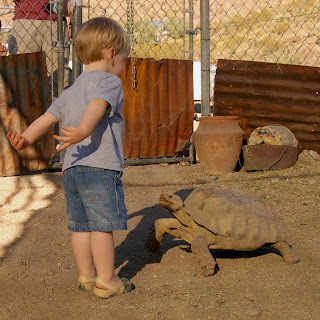 That was pretty much the end of our visit to the turtles as he was exhausted and this just pushed him over the edge. On the way back it was getting late in the afternoon. 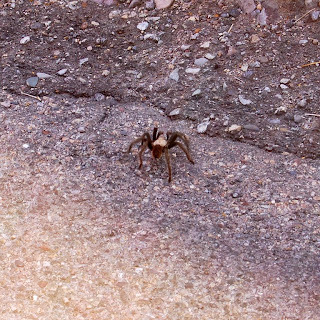 Driving down the road, Dahlia points at the road and goes, "look, it's a tarantula". Those things were big enough you could see them crossing the road! Like you would a mouse or a chipmunk! I made her slow down so I could take a picture out the window... Don't say I didn't warn you! We saw another one as well. 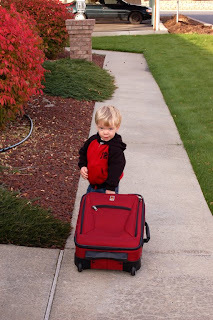 We made it home safely and after emptying our suitcases Cory wanted to help me put them away. Wait, wrong way, buddy, the shed is the other direction! The burros look like so much fun. The Bean would have loved them. 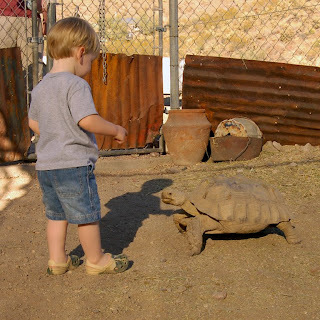 Looks like a wonderful time :) Too cute with the tortoise!! 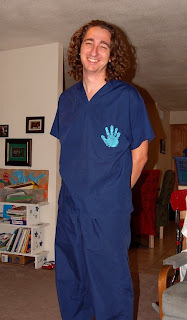 I came to say hello because the BlogFrog says we have 4 links in common. Figured I should say Hi if we have only 1 degree of separation in 4 directions! 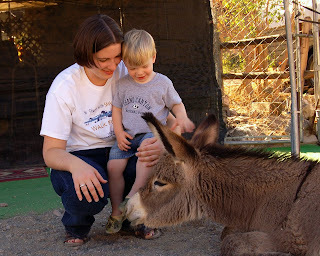 :) Love the donkeys! 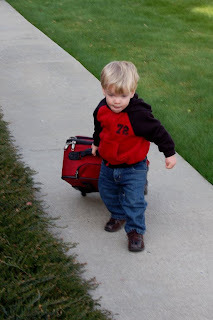 But the kids are even cuter! And...These young ones!! Route 66-- among other things there was a t.v program in which two hot movie stars of the time George Maharis and Martin Milner travel the route stopping in small towns across America. (Think Brad Pitt and George Clooney a few years ago) George Hamilton (who dated Lynda Johnson -- then President Johnson's daughter) was another contempory of these "hot" stars. I was in love with George Maharis a was half the girls in the US at the time. Did I mention that the travel was done in a Corvette??? 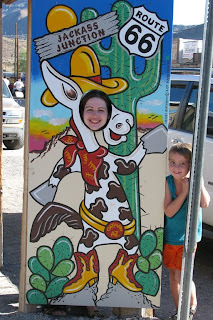 We drove that route a couple of summer ago and went through Oatman! 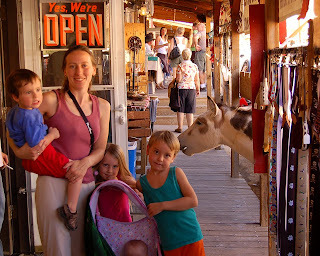 We, too, were fascinated by the burros! Very cool, huh?